Enhance the look of your home by using a flooring option that has been around for centuries. 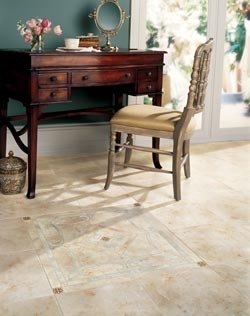 Tile flooring has been many discerning builders’ primary flooring choice throughout the centuries. Why? Because tile floors offer some of the best benefits imaginable for both homeowners and business owners. Upgrade the ambiance of your property with durable tile. In addition, this luxurious flooring adds a profound design boost to your home while still remaining firmly in your budget. Create a modern and sleek appearance in your home by installing porcelain tile. One of the most resilient types of tile floors, porcelain endures the heaviest foot traffic while retaining its color and beauty. That means you can create the one-of-a-kind look you want for your home without worrying about stains, scratches, moisture, fading, or other damages ruining its appeal. Ceramic tile flooring is truly one of the most versatile flooring products for property owners who want to create an elegant look. With the correct glaze or sealant, ceramic tile becomes one of the must-have flooring options for bathrooms and kitchens. This is because it is naturally resistant to high humidity conditions as well as impervious to water and stain penetration. Furthermore, this flooring is known for being extremely tough, which means you do not need to worry about cracks or damage for many decades to come. You can use it anywhere in the home! Available in many different styles, including realistic reproductions of hardwood and natural stone designs, ceramic tile is manufactured to fit your very specific needs. That means you can use it to easily accent your current designs and motifs or create a new theme from scratch. Contact us when you want to improve your home with impressive tile flooring. Our team is proud to provide complete services to customers throughout New Hyde Park, Floral Park, Great Neck, Manhasset, and Garden City, New York.